The ebook Ascension by Nikki Darling is beyond auto-biographical. I don’t even think it is an ebook. I don’t think it is an ejournal or an ediary. What it is . 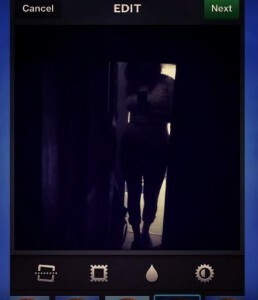 . . is a mess. Her hair is usually a mess. She has dirty feet. And these are not purposeful things. Nikki’s messiness is a direct result of the time she dedicates to personal branding in other areas. The disorder is a result of neglect. Nikki frequently neglects form and tries to bypass narrative. Or so she would have you think. This ebook is an electronic collage. A tribute to all things Nikki. A dip inside of her brain. And I have to admit I don’t like it there. The music is too old. It makes me uncomfortable. The songs are too polished, thick and unbending with old school veneer. Why can’t she just write a story, a chap book for my hands? I’m always tempted to tell Nikki to clean herself up. To clean up her work. To pull up her bra straps. To put on a bra. But her poems won’t wear one. The inclusion of screens, like mini-experiential pockets of havoc, give insight to the cacophony of song that blares in Nikki’s mind. Music is integral to her work and it isn’t just the sound. Ascension reflects her obsession with all aspects of the music including the performers, the presentation, and the cultural context. The performers, or the artists that Nikki focuses on are none that I am terribly familiar with. They aren’t ones that I enjoy. They are gender-benders and here is the crux of my discomfort. Nikki has an eye for cultural construction and is especially gifted at lifting images and iconography of the past decades up and layering them against one another. Again, this is a collage. There is no clear delineation of gender. Her preference for boys is met with a proclivity for presenting them in feminized forms. Think long hair, short shorts, gliding around on skate boards. 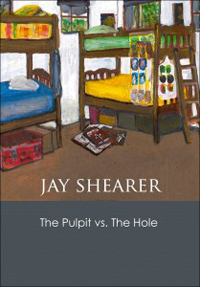 If you like underlining pleasurable and provocative sentences with a pencil, plan on keeping a sharpener at the ready while reading Jay Shearer’s chapbook The Pulpit vs. The Hole. 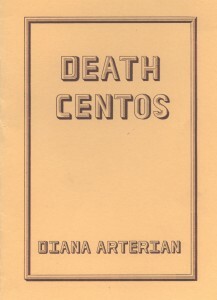 Gold Line Press understandably selected this story as the winner of their 2011 Chapbook Competition. This smallish booklet held me steadfast. The setting of a Brethren/Mennonite summer camp for adolescents is teeming ground for a fairly high order of microcosmic examination. Poetry pervades the prose and makes the prospect of underlining daunting, distracting and mildly disorienting. Also, I’m a sucker for parenthetical phrases set off with em dashes. By page two I became mopey about the brevity of the book. My desire thumming, I wondered, how can this book possibly give me all I need in such an austere package? Should I even get attached to these characters since our time together is destined to be short? What’s with these chapbooks anyway? Chapbooks are so concentrated that they make everything else seem like watery Kool-Aid. You will need to put down the pencil. Shearer imbued The Pulpit vs. The Hole with a scattering of themes that scoot and zip around the book like pre-adolescents hotfooting it through the woods at Camp Abednego. Pacifism is a hard sell to the youth of this book. Shearer deals with pacifism through the precocious voice of his youthful narrator, Marty. The slow to grow understanding of the pitfalls of non-participation reminded me of what had seemed a deeply significant process. Marty and Jordan, another camper, struggle to understand the limitations and challenge the boundaries of the adults’ proclaimed pacifism. They seem to be pushing into view some form of active pacifism. In dealing with pacifism, certain questions arise. The question of all questions, the question meant to discredit pacifism, the question that— asked or unasked— remains central to the demoralization and hindrance of complete alignment with the older forms of un-programmed Quakerism, the Brethren-ism, or the Mennonite-ism. We know the discomfort of the camp counselor as he listens to the disquieting question: “ ‘what would you do in World War Two?’ ” (p. 20). Of course the invocation of such a fundamental injustice comes from the endearingly irascible camper Jordan. Young people live in a constant state of hyperbole, and to invoke World War II is to force the adults to realize that this state of hyperbole, has at times, been a reality. So what, would you like “ ‘just let the Nazis kill all the Jews?’ ” (p. 20). Counselor Dan, answering for the entire population of pacifists — dare he say it? The answer he has to give? The answer that must, but can’t come with conviction, that “ ‘first, as with anyone, we’d try to talk to them’ ” (p. 21). Jordan scoffs quintessentially American indignation at this passive response offered up with only lukewarm sentiment on the floor of a camp cabin.